A quantia de teobromina encontrada no chocolate é pequena o suficiente para ser consumido seguramente por humanos, mas animais que a metabolizam mais lentamente, como cachorros, podem sucumbir por envenenamento por teobromina. A dose de teobromina que pode ser tóxica em cachorros gira entre 100 e 150 mg/kg. Geralmente chocolates ao leite possuem 154 mg/100g de teobromina; o meio-amargo cerca de 528 mg/100 g Complicações incluem problemas digestivos, desidratação, excitabilidade, e uma taxa lenta de batimentos do coração. Fases posteriores ao envenenamento por teobromina incluem ataques epiléticos e morte. ↑ FORD, Richard B. MAZZAFERRO, Elisa M. Kirk y Bistner Urgencias en veterinaria. Procedimientos y terapéutica. 8. ed. Madrid: Elsevier. William Marias Malisoff (1943). Dictionary of Bio-Chemistry and Related Subjects. Philosophical Library, 311, 530, 573. ISBN B0006AQ0NU. (French) Theobromine. BIAM (March 29, 2000). Retrieved on 2007-03-01. Baer, Donald M.; Elsie M. Pinkston (1997). Environment and Behavior. Westview Press, 200. "-ine." (2004) The American Heritage® Dictionary of the English Language, Fourth Edition. Houghton Mifflin Company. ISBN 0-395-71146-0.
theobromine. Dictionary.com. Retrieved on 2007-02-22. For convenience, the direct source of the three definitions used has been cited. Theobromine. On-Line Medical Dictionary. Retrieved on 2007-02-23. Xanthine. On-Line Medical Dictionary. Retrieved on 2007-02-23. 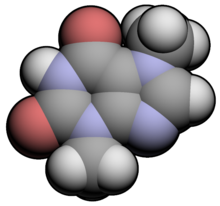 Dimethyl. On-Line Medical Dictionary. Retrieved on 2007-02-23. Walter Sneader (2005). Drug Discovery: A History. John Wiley & Sons. ISBN 0-471-89980-1. Thomas Edward Thorpe (1902). Essays in Historical Chemistry. The MacMillan Company. Sir Ghillean Prance, Mark Nesbitt (2004). The Cultural History of Plants. New York: Routledge, 137, 175, 178–180. ISBN 0-415-92746-3. Caffeine. The Pharmacogenetics and Pharmacogenomics Knowledge Base. Retrieved on 2007-02-22. Esta página foi editada pela última vez às 21h07min de 3 de dezembro de 2018.